Population Welfare Department District Chiniot 10 Jobs 06 Jan 2018 Daily Dunya. Population Welfare Department District Chiniot has announced 10 latest Jobs in Daily Dunya Newspaper. Jobs titles and number of posts is as follows, Store keeper (BPS-07) 01 Post, Family welfare Assistant (Female, BPS-05) 01 Post, Driver (BPS-04) 02 Posts, Naib Qasid (BPS-01) 03 Posts, Chowkidar (BPS-01) 01 Post, Maali (BPS-01) 01 Post, Sweeper (BpS-01) 01 Post. Interested Candidates can send their written application on simple paper along with attested copies of all Education Certificates, Domicile CNIC Copy. Candidates should be citizen of Chiniot District. 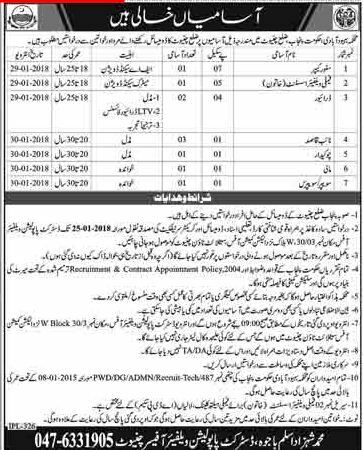 Population Welfare Department District Chiniot 10 Jobs, 01 January 2018. Qualification Intermediate, Matric, Middle, Literate.